Now that you're all set up as an affiliate of Organized Photos, you may be wondering the best approach to take for effectively promoting "Save Your Photos and Your Sanity." Of course, you can stick a banner ad on your site and hope for the best. That certainly can't hurt. By far, though, the absolute MOST effective way for you to earn commissions from "Save Your Photos and Your Sanity" is for you to send a personal e-mail out to your subscriber list. As I mentioned before, I intend to do all that I can to help you succeed. So, with everything you've got on your already full plate, I thought I'd give you a head start on pulling this together. To simplify the process for you, I've drafted an e-mail template so that all you need to do is insert your affiliate link, add your signature lines, and send it out to your subscribers. Of course, if you'd rather put in the time to craft your own e-mail, then by all means, please do so. I invite you to use any or all of the content in the e-mail that follows, as you see fit. 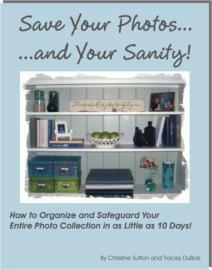 Have you tried again and again to get your photos organized but somehow always fall short of the goal? What if you had the opportunity to learn first-hand from photo organizing experts on how to overcome the roadblocks that have prevented you from succeeding? Now you can learn exactly how to organize and preserve your entire photo collection -- even if you've got decades worth of photographs and absolutely no idea where to begin. 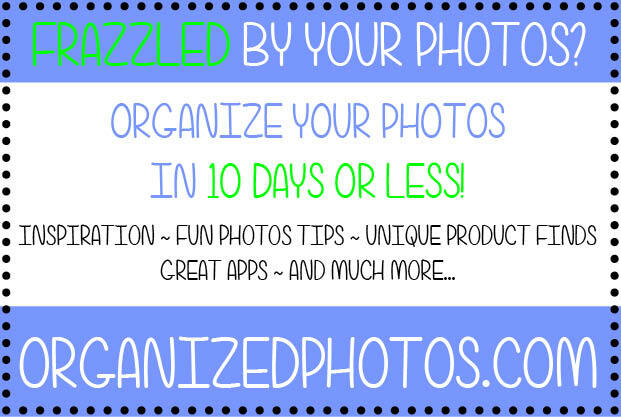 After hearing so many cries for help from my readers, I'm thrilled to have finally discovered a resource where you can get answers to all your photo organizing questions. Christine Sutton and Tracey DuBois of OrganizedPhotos.com know a few things about managing photographs. Over the past several years, Chris and Tracey have helped countless people organize, protect, and enjoy their precious photographs. Not only are Chris and Tracey the producers of the acclaimed, "Treasure Your Memories" video, but they've literally 'written the book' on organizing photographs. Chris and Tracey spent two years uncovering every tip, every secret, every possible method for simplifying the daunting process of organizing and preserving photographs and memories. And they laid out the entire process step-by-step, so that you'll know exactly what you need to do to keep your photos safe, and you'll know the absolute easiest ways to get yourself organized - once and for all! This 100 page e-book will walk you step-by-step through the entire process and give you all the answers you need so that you can finally get your precious photographs in order - once and for all! If you're thinking that this is going to be some dreadfully boring read, stuffed with scientific ramblings and meticulous organizational systems, then you can relax! 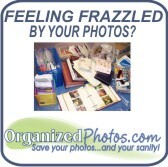 Chris and Tracey understand that the process of organizing photographs can feel overwhelming. (And, let's face it, boring). That's why they use every technique they can think of to liven up the process, and they use plenty of humor to make the process not just manageable but enjoyable! Remember when I said, "What if you had the opportunity to learn first-hand from photo organizing experts how to overcome the roadblocks that have prevented you from succeeding?" Chris and Tracey have decided to offer Save Your Photos and Your Sanity in an e-book format so that you can be sure to have the most up-to-date information at your fingertips. After downloading the e-book, you'll be able to start making progress right away. After searching high and low for answers to help my readers conquer their piles of photographs, I'm convinced that this information simply isn't available anywhere else.